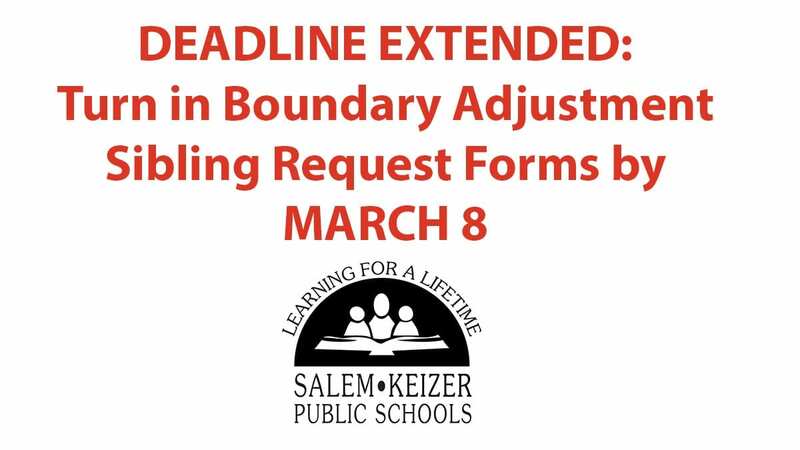 Because of the recent snow days, the deadline to turn in a Boundary Adjustment Sibling Request Form has been extended to Friday, March 8, 2019. Families whose residence address is affected by a boundary adjustment were mailed letters in February. If you believe your address is affected by a boundary adjustment but did not receive a letter, please contact your school. Debido a los recientes días de nevadas, la fecha límite para la entrega de los formularios de traslado de escuela para hermanos debido a los ajustes a los límites escolares fue extendida para antes del viernes, 8 de marzo de 2019. En febrero, fueron enviadas unas cartas por correo para aquellas familias cuya dirección de residencia se ve afectada por el ajuste a los límites escolares. Si usted piensa que su dirección se ve afectada por el ajuste a los limites escolares pero no recibió una carta, por favor, comuníquese con su escuela. Recently, something called the “Momo Challenge” has been making the news. In it, content that is created for children is supposedly interrupted by a scary-looking character who provides instruction to children about how to complete suicide. Other iterations of this story include similar experiences on WhatsApp or Snapchat. YouTube officials have confirmed that, contrary to press reports, it hasn’t seen any evidence of videos showing or promoting the “Momo challenge” on its platform. If the videos did exist, YouTube officials say they would be removed instantly for violating the platform’s policies. Additionally, there have been zero corroborated reports of any child ever taking his or her own life after participating in this “challenge” that many national news organizations are calling a hoax. * Download apps to help monitor your child’s online activity. A great example is “FamilyTime,” available on both Android and IOS. With the paid version, it allows you to customize precisely what content your kids should have access to, set time limits, track location, and more. The software gives you tools to set homework and bedtimes, or merely limit the total time that your kids spend on their phones. There’s also support for geofencing so that you get alerts when that phone enters or leaves a specific area, and location tracking, so that you can see where your child is. You can block or control on an app-by-app basis, apply internet filters, monitor calls and texts, and keep an eye on contact lists. The free version also offers some of those features. * Download “SafeOregon.” Managed by the Oregon State Police, SafeOregon allows you to report unsafe online behaviors, like bullying, by submitting a screen shot or written report. Reports may also be made anonymously. Talking to your children about suicide can be scary. The district is hosting community events just for that purpose. The next “Speak Up!” town hall forum will be on March 12 from 5:30-8 p.m. at North Salem High. Dinner, childcare and translations services will be available at no cost. As always, if you have any concerns about your child’s safety, please let us know so we can help. House. 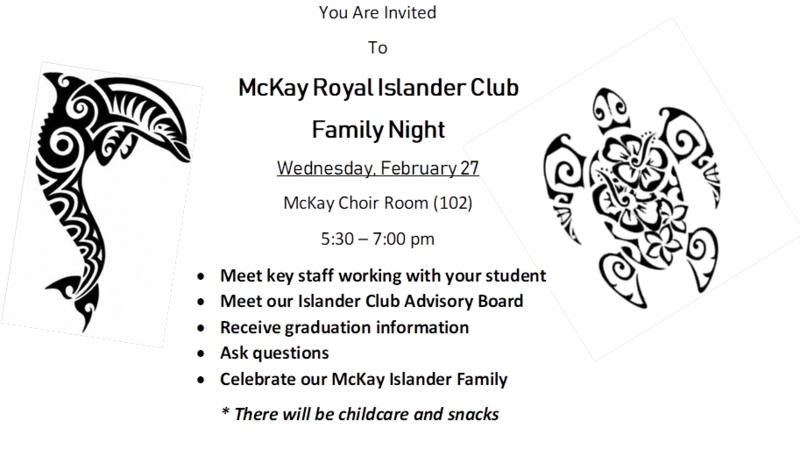 This is an opportunity for our future freshmen and their families to meet our staff and learn about the programs and activities at McKay. Child care and refreshments will be provided. Por favor marquen sus calendarios y únasen a nosotros en McKay el lunes, 3 de marzo de las seis a las siete y media de la tarde para nuestra casa abierta de estudiantes que entraran al grado 9 el proximo ano. Esta es una oportunidad de conocer a nuestro personal y aprender sobre los programas y actividades de McKay.Tendremos refrescos y cuidado de niños. From March 1 – April 5 in Social Studies classes, McKay students will have the opportunity to forecast their class schedule for the 2019-20 school year. They will review their graduation requirements, see their teacher recommendations, select their desired elective courses, and have an individual conversation with a Counselor. The McKay master schedule for 2019-20, as well as students’ individual schedules, are built based on choices made by students during this forecasting process, so please make informed decisions. We encourage parents to have conversations with students about their interests, and which classes and programs at McKay would be a good fit for them. 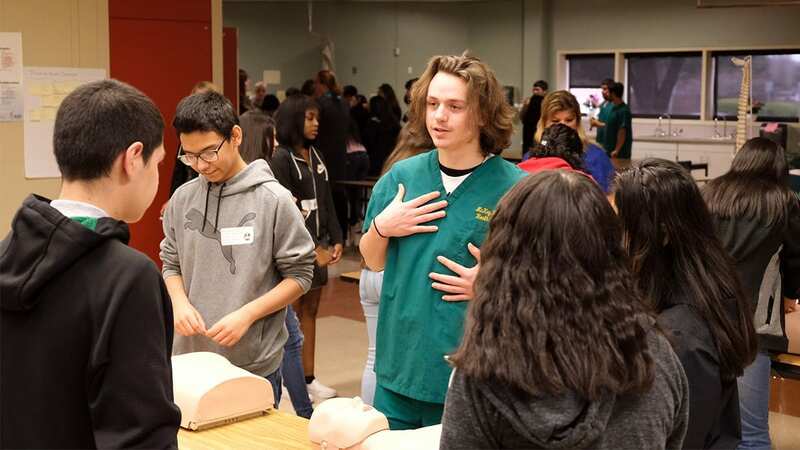 More than 330 eight graders from Stephens Middle School recently took a field trip to McKay High School to learn about Career and Technical Education (CTE) programs they can join as freshmen next fall. 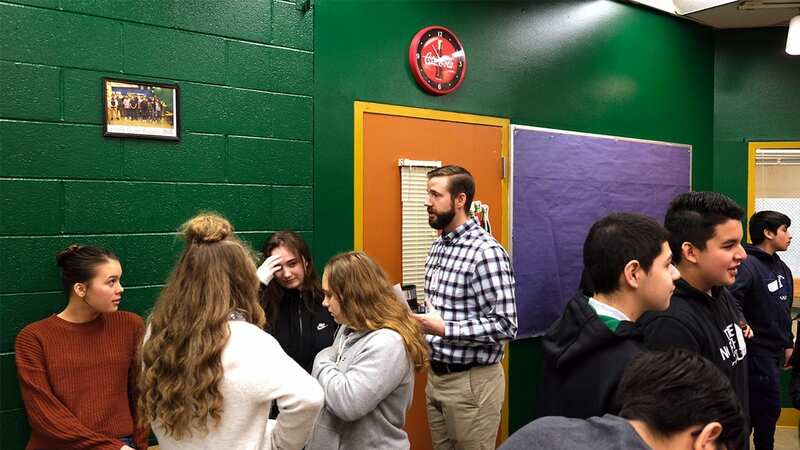 “We’ve been really happy with the showcase process and we’re getting students in the right programs,” said McKay Assistant Principal David Wood. 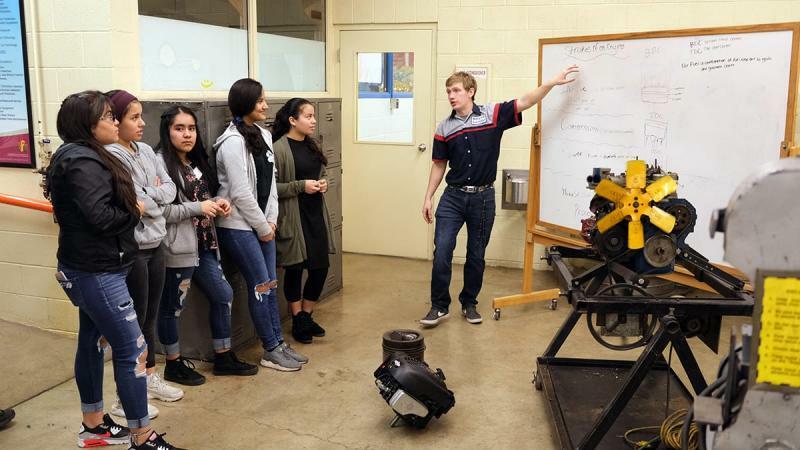 McKay CTE programs include: Agriculture, Automotive Technology, Business and Marketing, Computer Programming and Engineering, Construction Technology, Culinary Arts and Nursing. 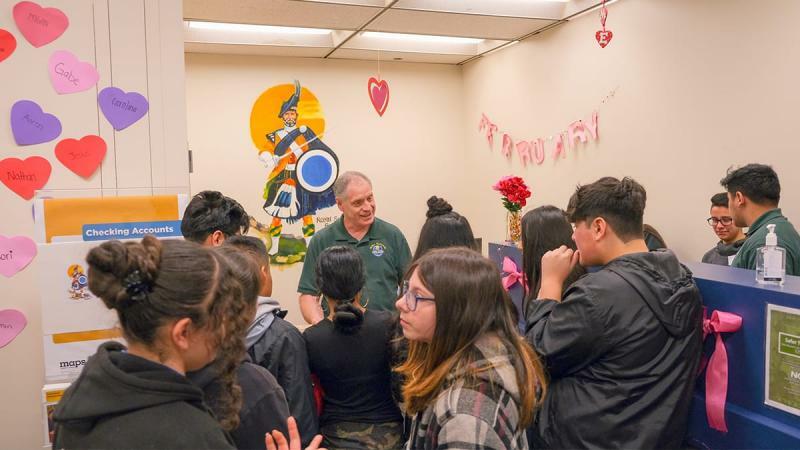 Teacher Gerald Hosler talks with Stephens Middle School students about the Agriculture program at McKay High School during the Royal Scots’ CTE Showcase on Tuesday, Feb. 19, 2019. 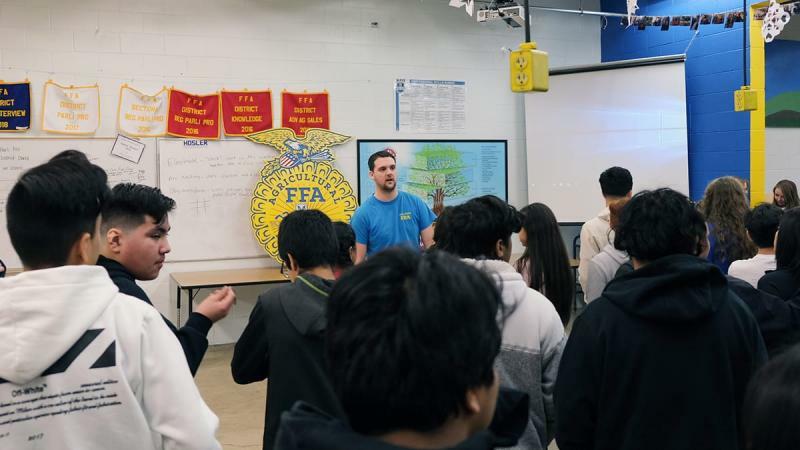 Mr. Hosler is also the faculty advisor for the Salem-Keizer Chapter of the Future Farmers of America. One of Automotive Technology teacher Noel Thiel’s students shares with Stephens Middle School eighth graders information about opportunities in the CTE program. Students in the Business and Marketing program learn how to handle money at the Maps Credit Union branch at McKay. Teacher Carl Garner talks with Stephens students about opportunities they can explore. Students in the Business and Marketing program learn how to run a business in the Scot Shop, where McKay students can buy snacks. Teacher Roy Adams talks with Stephens students about things they can learn. 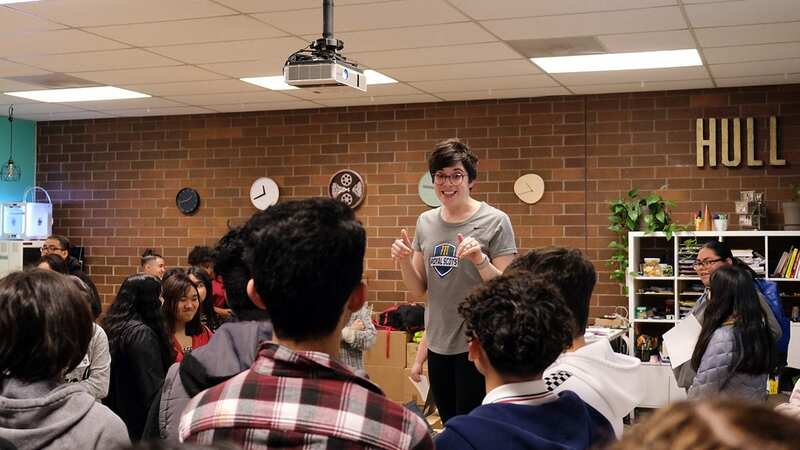 Computer Programming and Engineering teacher Katrina Hull shares her enthusiasm for STEM with Stephens students at the McKay CTE Showcase. Mrs. 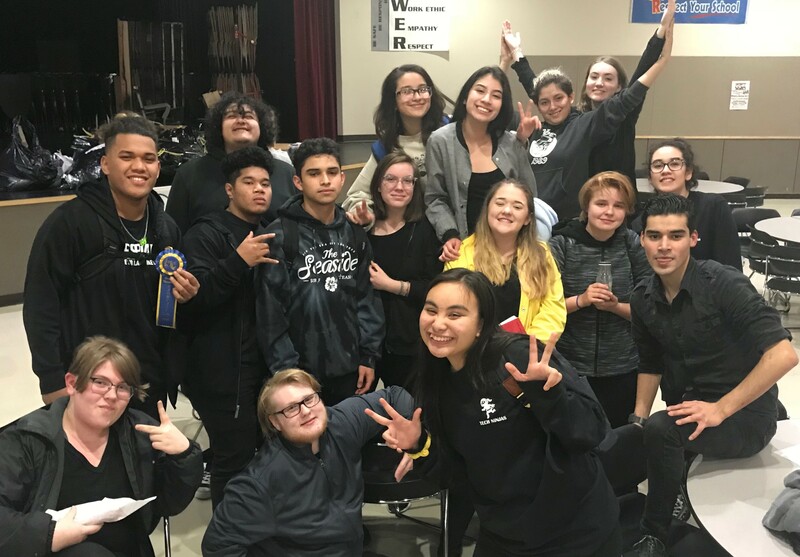 Hull was recognized for educational excellence with a 2018 Crystal Apple Award by the Salem-Keizer Education Foundation. 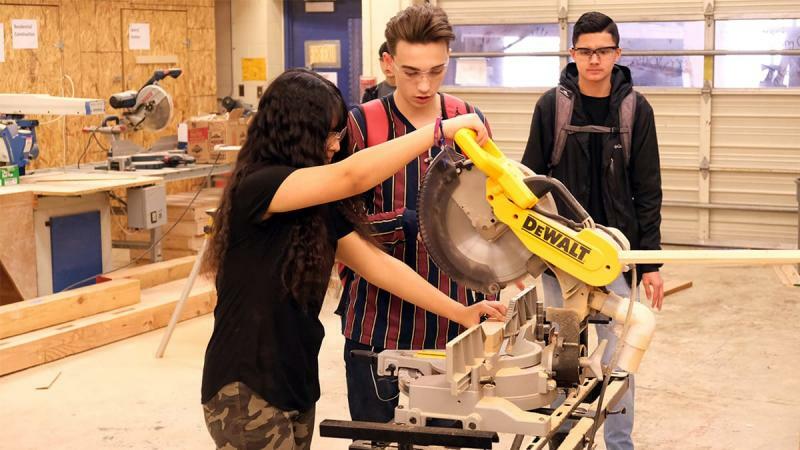 McKay students in teacher Michelle Zielinski’s Construction Technology program show Stephen’s students how to safely operate equipment during the McKay CTE Showcase. 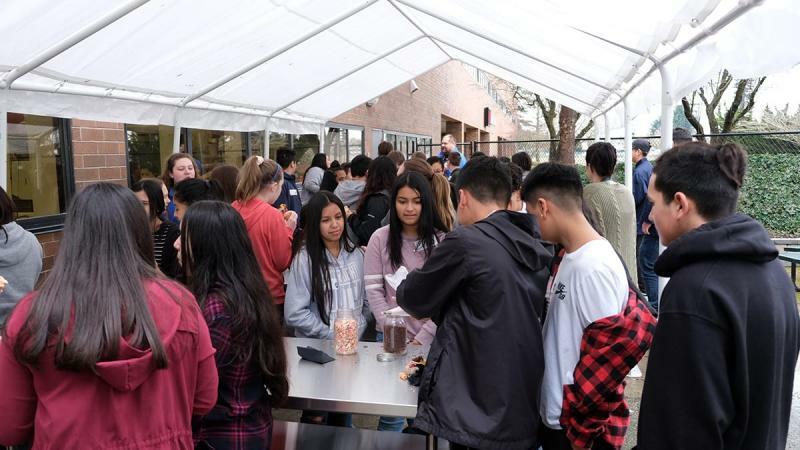 McKay Culinary Arts teacher Chris Feskens showed Stephens students the outdoor cafe area adjacent to his classroom during McKay’s CTE Showcase. Teacher Amy Holcomb also works with students in the Royal Scots’ Culinary Arts program. 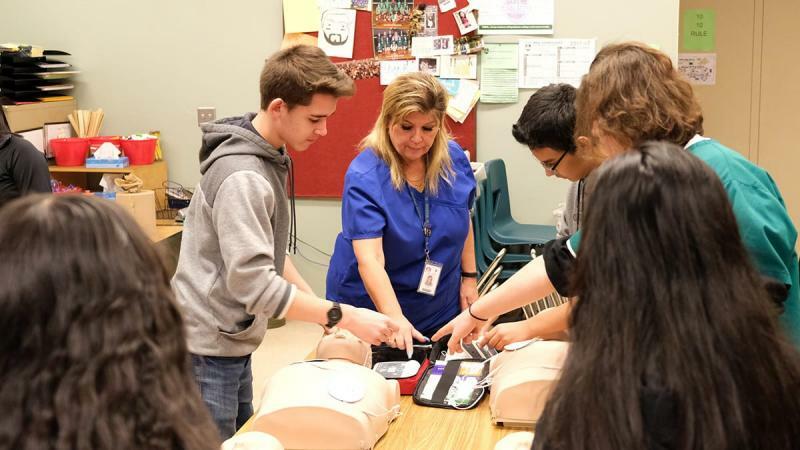 Nursing teacher Carol Martinez works with Stephens students at the McKay CTE Showcase for eighth graders. Teacher Amanda Rivera also instructs students in this program. 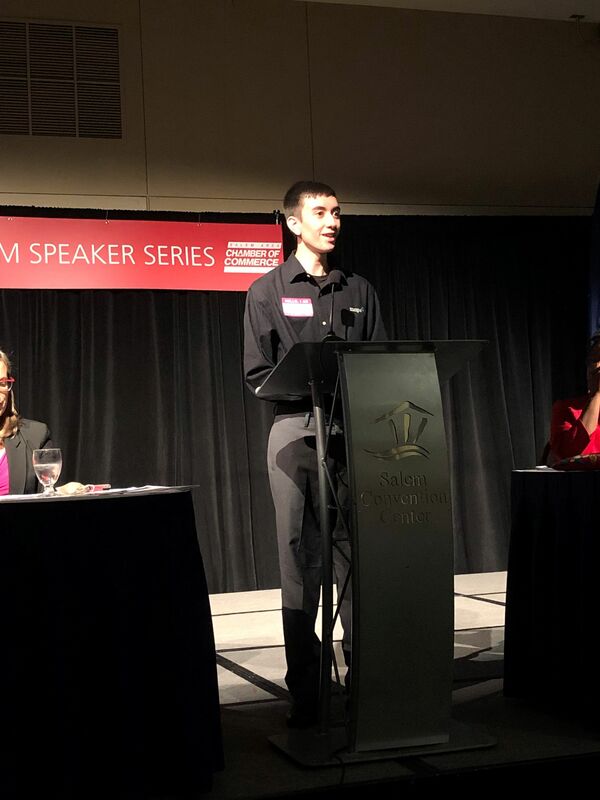 Monday, February 11, 2019 found six McKay students at the Salem Chamber Luncheon Forum. The partnership with McKay and Maps Credit Union was on full display during the luncheon. Jacob Boring, one of the management team in the Advanced Banking Management class, took the stage to share his experience with the program at McKay and then introduced two of the distinguished guest panelists. The panelists spoke about the importance of Career and Technical Education and the guests included Christy Perry, our Superintendent. Several panelists commented on the skills demonstrated by Jacob as he stood in front of the large crowd of Salem business and community members. Jacob did an amazing job representing McKay High School and the partnership we have with Maps. Another Regionals success! This group of first-time competitors battled sickness & nerves, pushed through, supported one another, and learned a ton! Special to the day: senior, LJ Allise, walked (sang?) away with the third highest score (of 130 singers) and qualified to rep McKay at STATE and NATIONALS!!! Go, Scots!